Don't forget the links above! ADULT ACTION FICTION!! NOT FOR READERS UNDER 18 YEARS OF AGE. 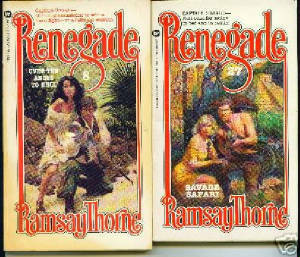 Between 1979 and 1986, using the pseudonym "Ramsay Thorne", pulp fictioneer extra-ordinaire Lou Cameron wrote 36 "Captain Gringo" adult western novels featuring as protagonist Richard Walker, better known as "Captain Gringo". The series is now lamentably out of print, but Captain Gringo should--must!--live on! Join the Captain Gringo Preservation Society today! Without becoming too puerile and overstating the case, the CGPS believes that these bawdy little historical pieces (the novels!) deserve more recognition than they have received. At the very least, they deserved to be remembered. Cameron also wrote the "Longarm" western fiction series under the pseudonym of "Tabor Evans". 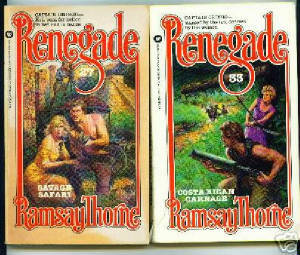 Cameron also wrote numerous other adventure pieces. Lou Cameron who currently lives in New York City, is one of the most prolific living authors. All you have to do to join the Captain Gringo Preservation Society is buy at least one book of this series, read it, and tell a friend. Check our "Captain Gringo Check List" link at the top of this page.